This is the ninth installment of the Impact series, #SocialGoodStars. The people highlighted here are passionate, dedicated philanthropists, strengths to their communities, and social media masters. They also happily share their vast knowledge with others, making them shine as leaders in the Social Good world. You can read the eighth interview with Maggie Nielsen, partner at Global Philanthropy Group, here. 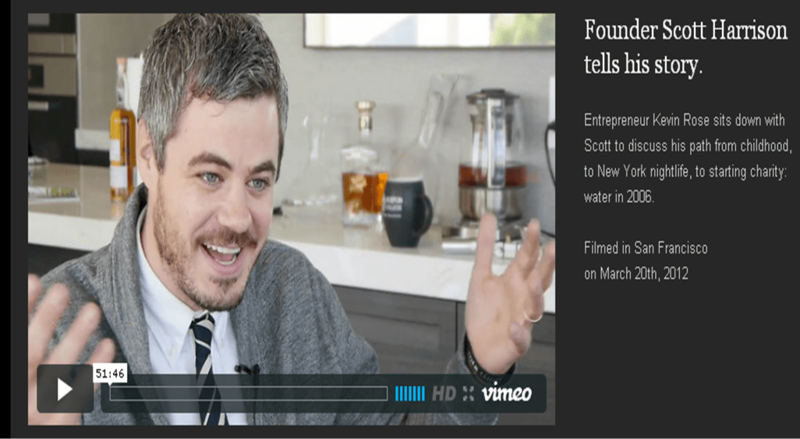 Scott Harrison is well-known worldwide as the charismatic founder and CEO of uber-impactful clean water charity, charity: water. But the story of how charity: water came to be is quite unique. It’s not often that such a colorful, inspiring, paradigm-shifting story happens. Scott’s is just that, and the global impact charity: water has had in the six years it has been around is staggeringly beautiful. I had the honor of learning more about the history and progress of one of the most productive water organizations out there through Scott. Raised in a loving Christian home, Scott developed a rebellious side that led him to New York City. Part of a band, he got into the club circuit, then became a popular and wildly successful club promoter for many years. Although the glamorous celebrity lifestyle was irresistible for a time, Scott had an epiphany one New Year’s Eve. “I had become the worst person I knew,” surrounded by and enmeshed in the partying crowd, with no sense of purpose. In spite of what appeared to be a jet-setting, extravagant life, “I was desperately unhappy and needed to change,” Scott says. So in 2004 he decided to “become the exact opposite of what I was then,” and after being passed over my numerous nonprofits trying to volunteer, he paid Mercy Ships, a hospital ship which provides life-changing surgeries, to be a volunteer in Africa. Having spent his wealth at about the same or greater rate at which he raked it in, his life went from lavish to austere in a flash. As the photographer responsible for documenting the thousands of surgeries Mercy Ships did over the next two years, Scott was astonished by the poverty he saw, and realized how important the most basic things most of us take for granted really were. One day in Liberia, he saw a surgeon dig a well for a village, next to a filthy human water source unfit for animals, and turn it into clean, fresh, safe, drinkable water. At that moment, his life forever changed. Back in NYC in 2006, Scott dived into his passion to help bring clean water to the one in nine people in the world who don’t have it now — 800 million people. His unique club promoter background inspired an original idea that is now a commonplace and hugely successful fundraising tool — donating a birthday. First he threw a party at a club, and raised $15,000. But next, he thought, “What if people skipped the cab fare, the cover charge, the drinks, and the tips, and just donated that money?” He started with $1 for every year he’d been alive, and voila, the “donate your birthday” revolution began. And thousands of birthdays donated later (to date), millions of people have been given life-sustaining, clean drinking water. Folks like Will and Jada Pinkett Smith, Alyssa Milano, Justin Beiber, and countless other celebrities have given up their birthday gifts to give. And of course, thousands of caring people around the world have too. And not just birthdays — proceeds raised with creative activities like skydiving, marathons, lemonade stands, scrapbooking, mountain climbing, you name it! One of the most unique, and original, things charity:water is also known for is the 100% model. One hundred percent of all donations go to drilling wells. This was a novel idea, and one Scott was adamant about. “People would constantly mention how they weren’t sure if their money was going to the cause, or to other expenses,” a conundrum he wanted to prevent. All expenses come out of a separate account, so all donations flow directly to water. And not only does charity: water change lives in the developing world, but Paull and the team are building an experience for supporters that will do the same at home. Another groundbreaking idea was leveraging technology to further illustrate just how life-saving an impact every dollar makes. Before it was a more commonplace service, Scott started tagging wells drilled via GPS, and showing photos and videos of the sites and the happy people they serve. The impact this has is monumental — the story tells itself, through the smiles, joy, and laughter of kids and adults, even in some of the most remote places on earth. With the ability to tangibly not only see the wells, but the phenomenal effect they have on entire communities, donors feel the concrete impact they make in a very visceral sense. And by using social media to spread the message, millions of people get to see those results every day. “A person dies every 15 seconds from water-borne diseases. That’s an enormous problem. But we are having a positive impact on a large scale,” notes Scott. Recently charity: water raised enough money to purchase two drilling rigs, which exponentially increased drilling ability. Scott and the charity: water team, along with donors and volunteers all around the world, are indeed having a positive impact. To learn more about how Water Changes Everything, watch this video. To donate to charity: water, click here. 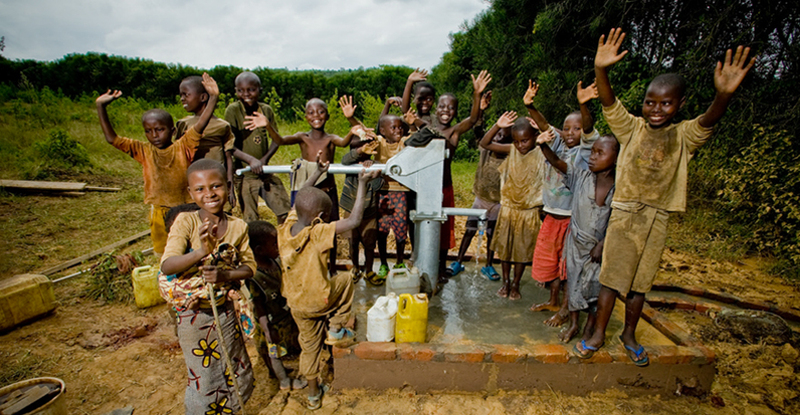 You can also follow @charitywater on Twitter, and Like them on Facebook for more. Amy Neumann is a social entrepreneur, writer, speaker and consultant on social good marketing. Check out her Charity Ideas Blog and follow her on Twitter @CharityIdeas.